911 Computer Repair’s Hosted VoIP now allows your business to have enterprise-class features no matter how large or small your company is. This service will grow with you, from one phone, to as many phones as you will ever need. This will be the last phone system you will ever need. There is no reason to spend thousands to get rid of your old phone system. Most companies end up spending less than they are currently paying for phone service and in addition, they also get a new phone system at no cost to them that includes phone service. Start saving money and call us today! Monitor and control your phone from your computer with our Desk Assist app. 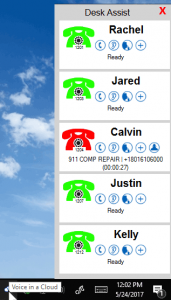 You can now see who is on the phone and who they are talking to without leaving your desk.